Dr. Mohamed Ibrahim announced a discovery of a statue of the daughter of Amenhotep III. 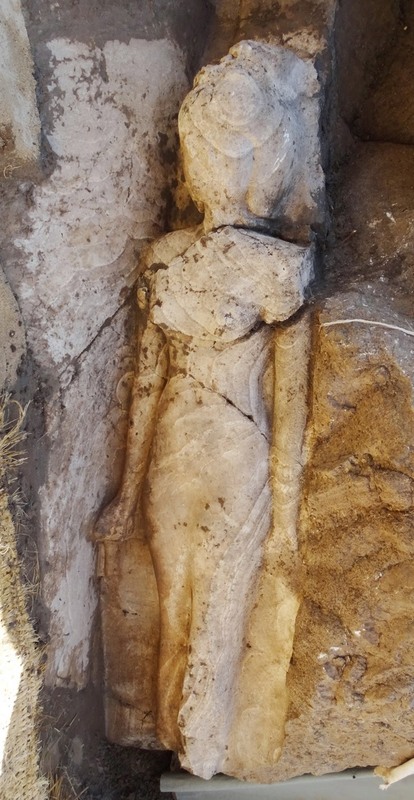 The statue of 170 cm height and 52cm width was discovered by the Egyptian European mission directed by Dr. Hourig Sourouzian working on the site of Amenhotep III in Kom El Hitan on the West Bank of Luxor. The Minister said that the discovered statue is a part of 14 meters height colossi of alabaster used to be erected in front of the third pylon of the temple. Most of the colossi parts were discovered in the past few years. The colossi would have shown Amenhotep III with his daughter who was called "Iset". According to the Minister, the statue shows for the first time this Princess with her father on her own although she shared other statues with both her parents and sisters which are on display at the Egyptian museum on Tahrir. Ali Asfar said that the statue shows the King sitting on his throne and his hands on his knees and his daughter standing between his feet. The daughter wears a round wig and laying her hands next to her holding a menit (menat) necklace in her right hand. Her name and titles were inscribed near her feet including "Great Royal Wife" and "The beloved of her father". Her face was damaged by erosion and her feet are missing. Abd El Hakim Karar, director of Luxor antiquities said "A project to restore Amenhotep III colossi and regroup the statue of Princess Iset is going on at the moment in order to erect it where it used to be in front of the third pylon."